Knowing little about past artists St. Olaf has brought to campus, I set about my research seeing if any of the few jazz artists I know had ever performed on campus. 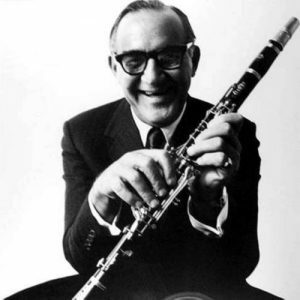 One of my favorite being Benny Goodman, I began there. Although he never did perform on campus, and his name did not result in many articles, I did find a few important ones that expand on previous posts in this blog. In this post in particular, I will be adding to what Noah Livingston discussed this week as well on diversity within the music department at St. Olaf College. Kristi McGee, a senior in 1989-90, wrote a strong letter explaining her reasoning for St. Olaf desperately needing a Jazz program in its curriculum. Whereas Noah’s found article seems to have a focus on the lack of diverse students at St. Olaf, McGee focuses on the musical and political benefits in relation to the college that a jazz program would bring. It seems ironic that an institution such as St. Olaf with high aspirations, and goals of diversification has not implemented a formal Jazz program. The emphasis on sacred and choral music and the disregard of other important musical genres, mainly Jazz, perpetuates St. Olaf’s image as a homogeneous, conservative, and conformists institution. Any college cannot advocate for diverse student body while maintaining a conservative mindset on any matter, and although the college today is very open to dialogue, discussion, and change, it is evident through many of this blogs post that St. Olaf was not always accepting of opposing viewpoints. It appears that in the late 80’s and early 90’s, St. Olaf was in flux as it seeked to gather a larger diverse student body. Though it wished to accept new perspectives, it was not ready to let go of more traditional views on western music forms and what was considered art music and popular music. 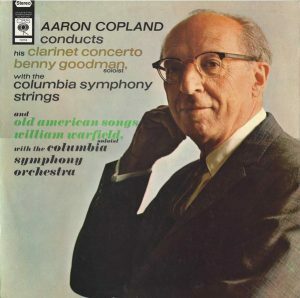 Copland Clarinet Concerto, preformed by Benny Goodman, conducted by Aaron Copland, 1963.
explain how contemporary composers such as Ravel and Stravinsky had jazz influence their work. The example I will be using is Benny Goodman and how he influenced Aaron Copland’s Clarinet Concerto. Goodman is a jazz and clarinet legend, and is considered the “king of swing.” His style and work as a clarinetist and as a band leader went on to influence a multitude of other artists and composers. This includes Aaron Copland and his Clarinet Concerto. Although it is now a standard of the classical clarinet repertoire, Copland’s Concerto was inspired by jazz techniques and Benny Goodman’s own playing. McGee goes on to describe, in her own way, that to acknowledge jazz in an academic way would be to elevate it to a similar status that the school holds its coral and traditional western music to, which would then better acknowledge the work of the African American and other diverse American population that were instrument in creating and defining the one music style that is original to the United States, jazz. Copland, Warfield, Goodman, Warfield, William, Goodman, Benny, Copland, Aaron, and Columbia Symphony Orchestra, Performer. Concerto for Clarinet and String Orchestra : With Harp and Piano. Old American Songs [sets 1 and 2]., 1963. McGee, Kristi. “Jazz program desperately needed in music department.” Manitou Messenger, 06 Oct. 1989, pp. 5.
jazclarinetist. “Benny Goodman – Copland Concerto for Clarinet and String Orchestra.” YouTube, YouTube, 28 Mar. 2012, www.youtube.com/watch?v=PmMFL1zZ-tU.